It is a simple add-on to automatically create an Provisioning Daily Writs. Fixed outputs "Recipe  is unknown. No items were crafted"
Correcting the problem that an error occurs during automatic creation. Disable automatic creation if do not know the recipe. Fixed a problem that can't find a recipe if upload cooking skills after receiving a daily request. Fixed Function to create master request item without receiving an order. Fixed function to alert missing materials. 1. Significant change in code. 2. Started to support Home Storage. Fixed a bug in the error log when there was no recipe. 2. Change processing order of daily and master. 2. Bulk Creation function added. We will start investigation immediately. Sorry to trouble you, but please wait for a while. I think the change is probably not temporary and would be grateful if you're able to amend the code to make it functional again. Contrary to what other commentary might suggest, I don't believe you "need" to do anything. I appreciate all the time you've taken to work on what you have, and do not expect you to continue if you do not want to. Version: 1.2.15 has been updated. Hope you can look at ! Currently, all add-ons that call the system function [GetCraftingSkillLineIndices()] are in error. Oh I see, that right I've few other mod who got problem too since today. My guess is that it checks if i have a writ, i do but i dont know that recipe and since im crafting something else it still acts as if im doing the writ, but im not. Unfortunately, I have discovered that Daily Alchemy and Daily Provisioning can -- at least in some situations -- evidently interfere with Writ Worthy auto-crafting for Sealed Master Alchemy Writs, and for Sealed Master Provisioning Writs, respectively. As far as I know, neither Daily Alchemy nor Daily Provisioning is documented with regard to Master Crafting Writs, whether Sealed or accepted and pending. I have posted these comments to the tab for Writ Worthy, too. (1) Alchemy: The character did not have a daily Alchemy Writ pending, nor an accepted Master Alchemy Writ pending. Nonetheless, from the output to the crafting station UI, apparently Daily Alchemy attempted to complete one Sealed Master Alchemy Writ. But only four units of the potion were crafted instead of eight. Apparently Writ Worthy attempted to craft the potions too, but failed. (Note: the Sealed Master Alchemy writ remained unaccepted.) I disabled Daily Alchemy and manually crafted four more units of the potion. Then Writ Worthy auto-crafted the items required for the two remaining Sealed Master Alchemy Wits in the character's Bags. without incident. (2) Provisioning: The character had an uncompleted daily Provisioning Writ, which I did not realize was pending. 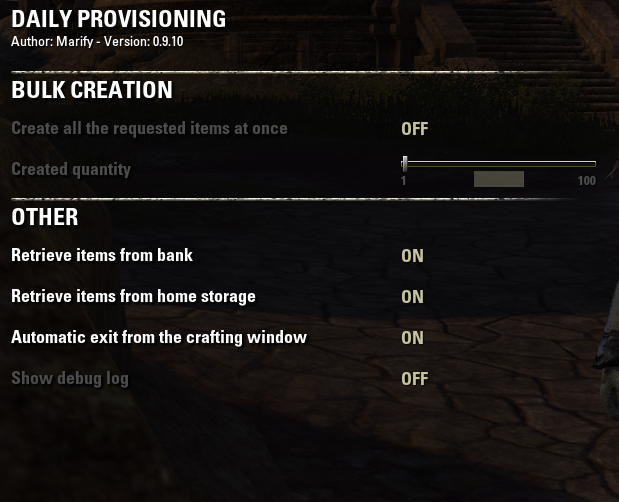 From the output to the crafting station UI, apparently Daily Provisioning crafted the items for the pending Provisioning Writ. The Sealed Master Provisioning Writs were ignored. Probably Writ Worthy would not or could not craft items for them because the items for the daily Provisioning Writ had not, of course, been delivered. 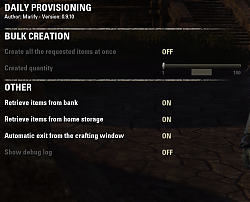 After my character delivered them, I disabled Daily Provisioning, as a precaution -- so, I do not know whether Daily Provisioning will attempt to craft the items for a Sealed Master Provisioning Writ when one is present in the character's bags. Then Writ Worthy crafted the items for the Sealed Master Provisioning Writs without incident. Master writ asking to Craft Lusty Argonian Maid Matze and the addon keeps crafting Matze, wrong recipe. 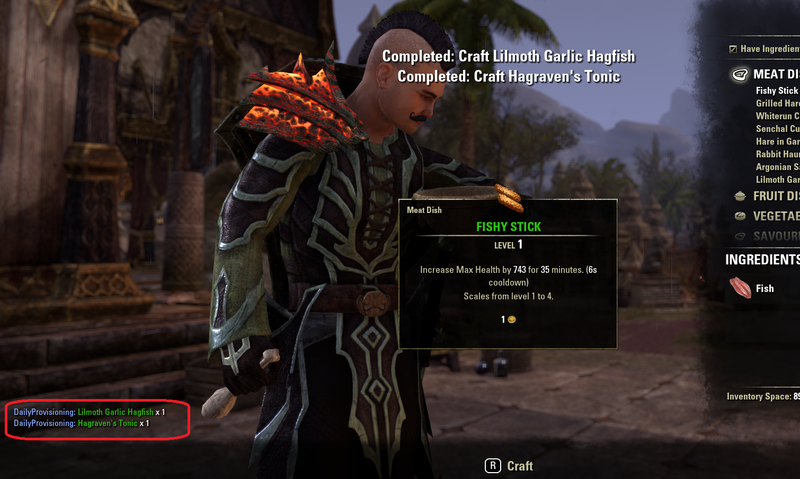 My character knows every recipe in the game so not sure why this is doing it. Worked like a champ today. OMG Thank you so much for the fix! Luv u!